Of course the Helmsman Trawlers website provides Features / Specifications, Interior / Exterior Photos, Pricing / Options and 360 Virtual Tours of their models to assist with ordering your new Helmsman. But a newly added feature to the Helmsman Trawlers site now puts you just one click away from viewing their inventory of available new & used Helmsman Trawlers. Go to helmsmantrawlers.com – look for the Available New & Used Helmsmans button – then go ahead…click! Helmsman – take the wheel! It’s always interesting to peek into the decision-making process behind a boat purchase. 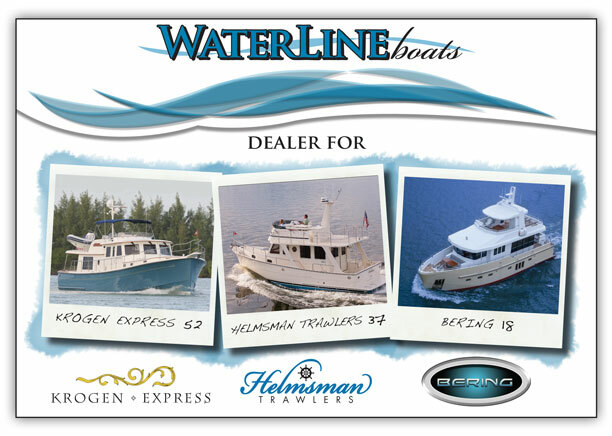 Different buyers have different criteria, which explains the wide variety of boats for sale. Seldom have we seen a selection made with such thought and deliberate care as that made by Fred and Stephanie Kaufhold. Fred retired as an officer in the US Navy, and then his time on the water began in earnest. Fred and Stephanie purchased a world-cruising sailboat in England and then sailed and lived aboard for 25 years, finally arriving in the Pacific Northwest. Enroute they’ve worked as delivery captain and crew for countless yachts of all types up and down the US east coast. So it can fairly be said that they know their way around boats. Economical cruising speed of 8 knots, but with a top speed of 15 knots. A long list of “musts” and “wants”. They found only four models that could respond to these criteria and settled on a Helmsman Trawlers 37 Sedan in its single stateroom version. But — alas and with some despair — no used models were available on the west coast. 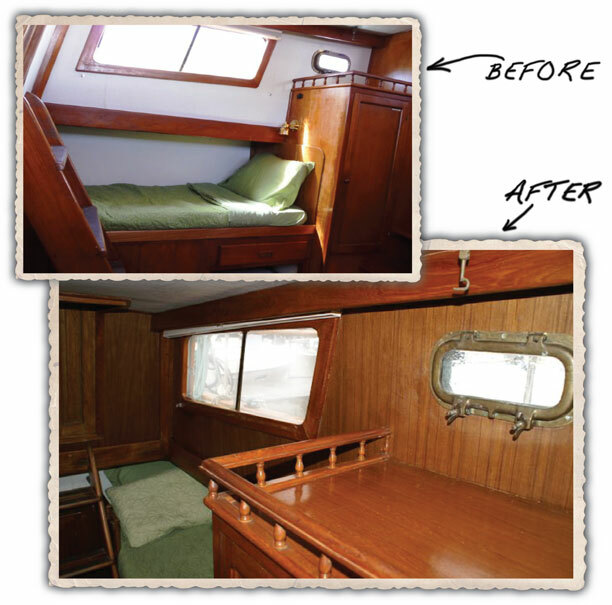 So Waterline Boats helped them purchase one in Annapolis and they shipped it to Seattle! Needless to say Fred and Stephanie are excited about their new boat after planning and searching for so long, and they look forward to many happy years of cruising ahead. Having searched with such well-defined criteria this pre-owned Helmsman Trawlers® fits them perfectly! 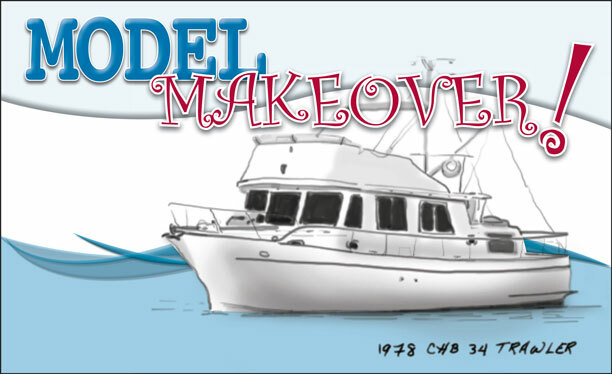 Model Makeover….Has She Or Hasn’t She? SHE HAS! And who of us hasn’t thought about getting a little work done? She is located at the Waterline Boats Docks on Lake Union in Seattle. 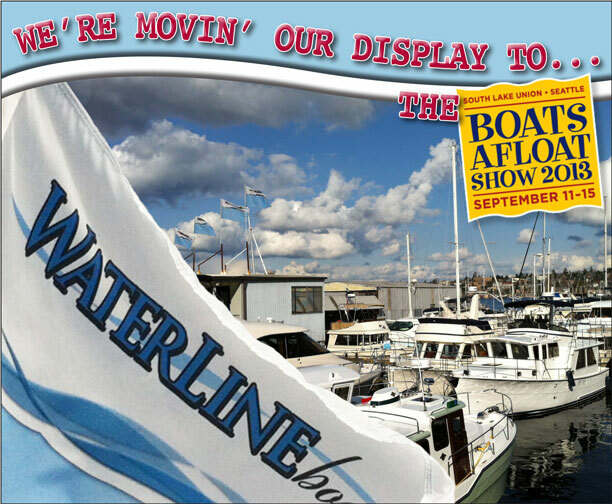 We’re Movin’ Our Display to The Boats Afloat Show 2013! 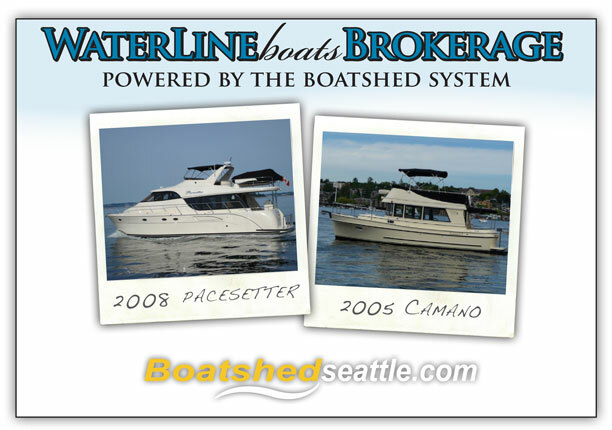 Well, not everything… But Waterline Boats / Boatshed Seattle will have a 2008 (never been sold) Bracewell Pacesetter 540, a 2005 Camano 31 Trawler, and a new Helmsman Trawlers 37 Sedan in the show. And we’ll have a courtesy float with information on Krogen Express Yachts, Bering Yachts, Helmsman Trawlers and all of our Boatshed Seattle brokerage listings. This promises to be a great show — with a good weather forecast and more boats on display than we’ve seen for years. Now is the time to buy. Looking is good too! 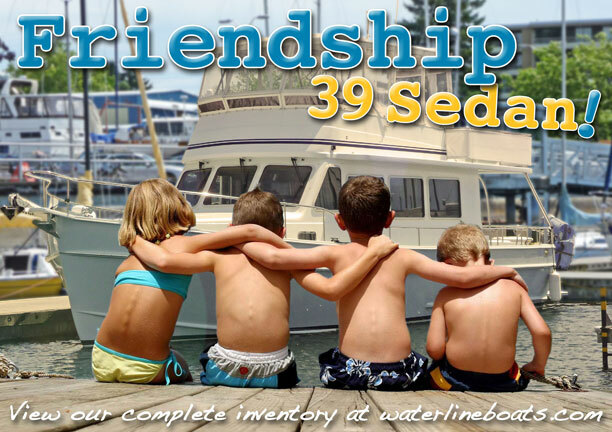 or a Friendship 39 Sedan Trawler! This boat has all the makings of a long-lasting Friendship – she’s in excellent condition with low hours and an attractive, functional design. She features warm, attractive joinery throughout her open interior, which includes a large salon, two staterooms and a nicely appointed galley. Her incredible flybridge is perfect for socializing with its full enclosure hard top and tremendous seating and entertaining capacity. 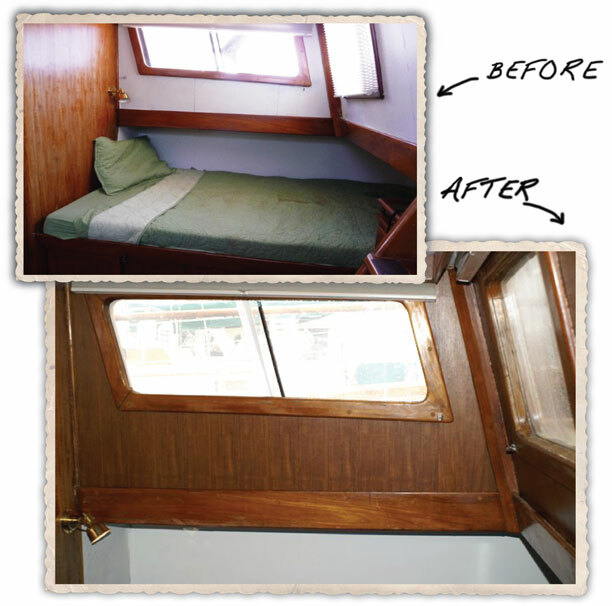 Practical walkaround side decks and high bulwarks make this ideal for those who insist on easy, safe access all around the boat. Solid construction features, fine joinery, quality stainless and many more well-done characteristics mean that this is a Friendship that will last! 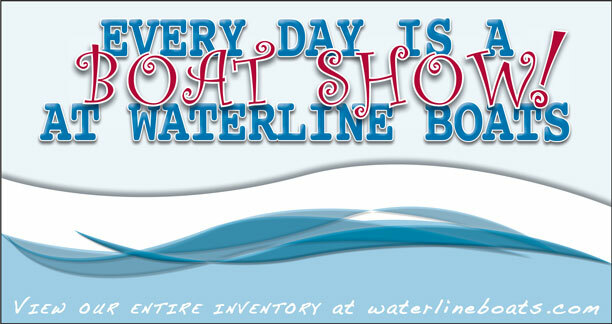 Every Day Is A Boat Show At Waterline Boats! The NEW Waterline Boats / Boatshed Seattle docks accommodate more boats and provide greater visibility and access making it feel like a boat show everyday! We have thirteen pre-owned and two new vessels at our docks. Many are reduced in price – all are ready to be viewed! To preview our present “Boat Show” line-up click on the photos below. If the specs, photos, and videos spark your interest come on down to our 2400 Westlake Avenue North Offices and Marina and see that intriguing vessel for yourself. Admission is free! 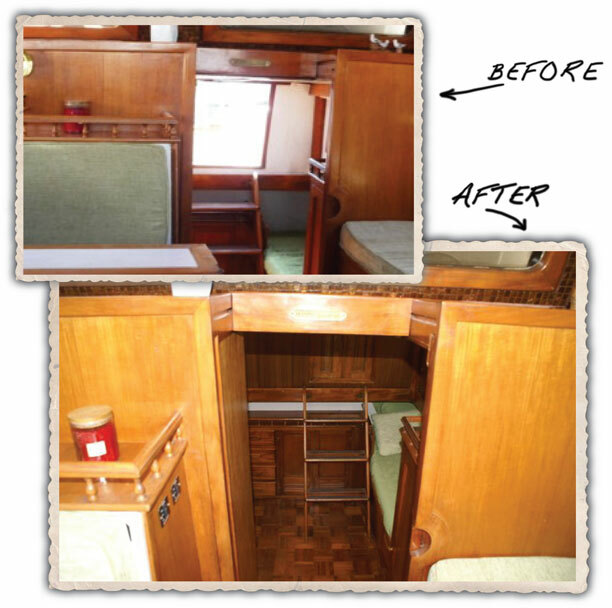 Helmsman Trawlers 38 Pilothouse Featured! Digital magazine Pacific Nor’West Boating celebrated its first year with their March 2013 issue. Congratulations PACNWBOAT.com! 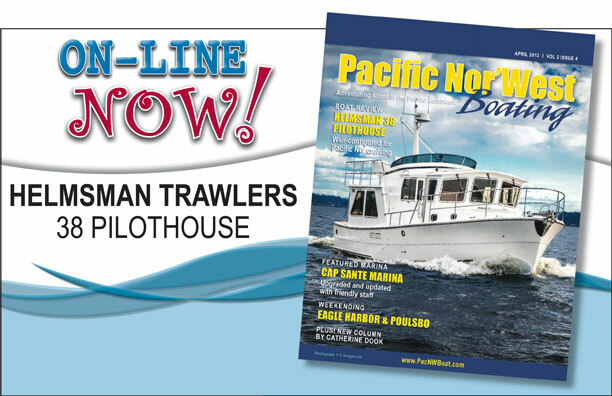 Pacific Nor’west Boating begins their second year of on-line publishing by featuring the Helmsman Trawlers 38 Pilothouse in the April 2013 issue. Click on the link and turn to page 6 to read the feature article. Helmsman 38 Pilothouse Well-configured for Pacific NW Cruising.